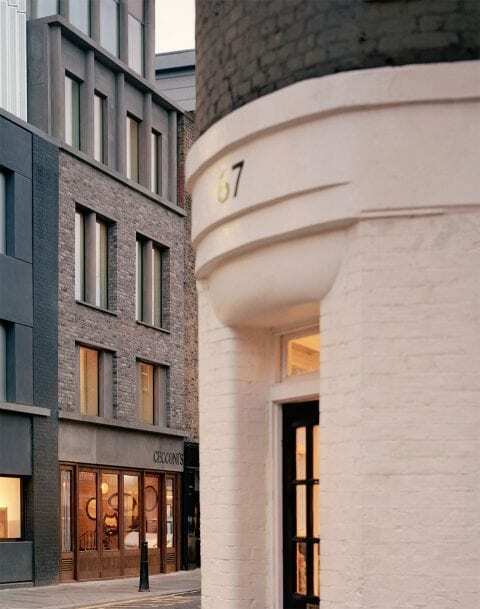 Redchurch Townhouse is a hotel in Shoreditch, London, completed in two phases. 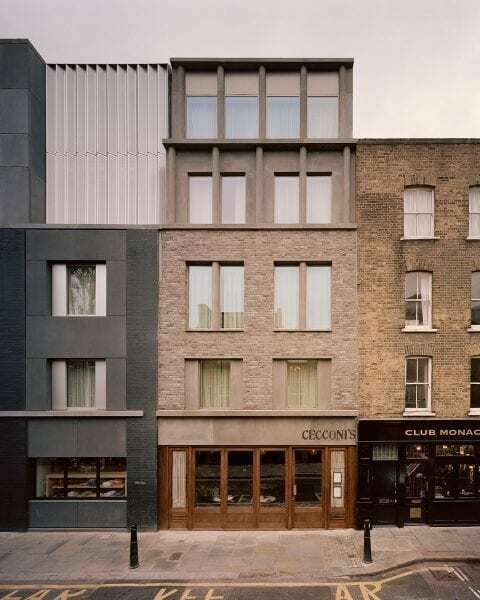 The first of these was Redchurch Corner, on the completion of which our client purchased the adjacent building at 56 Redchurch Street and commissioned 31/44 to develop proposals for a significant extension to their hotel. 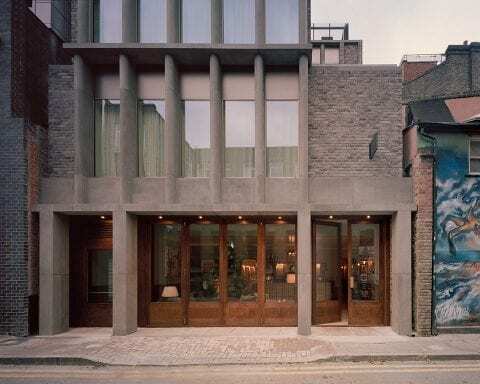 The existing dilapidated single-storey building was demolished and replaced by a new building with two basements and four/five storeys above ground, including a restaurant, bar and an additional 21 hotel rooms. As a practice that consistently looks to the existing context when developing new proposals, it was a new experience to use one of our own buildings as part of these existing conditions –especially one so recently completed. 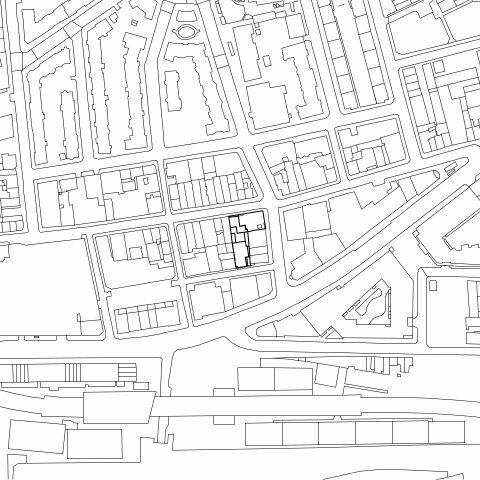 The same thinking that drove Redchurch Corner can be seen in Redchurch & Whitby, with the proportion of the facades and use of relief specifically chosen to reflect the conditions adjacent. 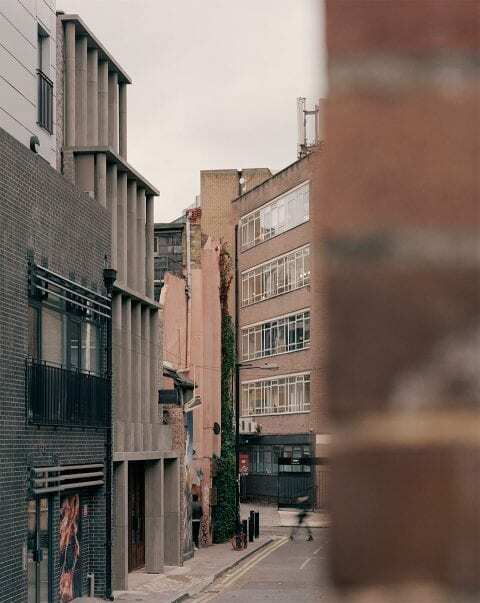 Rather than being located on a corner – with two facades relating to different conditions, but read simultaneously – the later scheme runs through the urban block, with distinct facades onto Redchurch Street and Whitby Street. 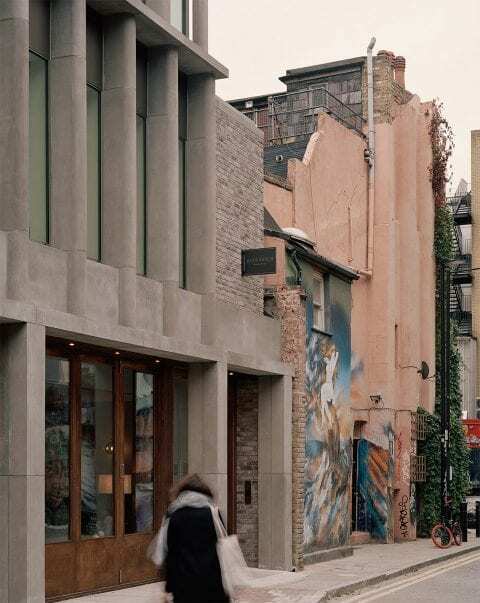 The Redchurch Street facade, as with that on Redchurch Corner, relates to the Georgian buildings elsewhere along the road, with a sparse brick facade articulated by detail, texture and quality revealed only around windows and doors. 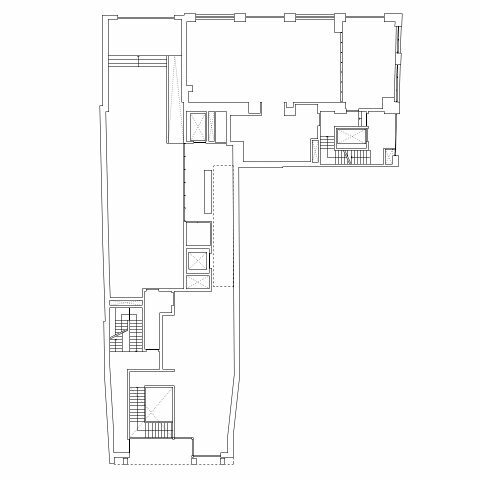 Openings are scaled to mediate between the two neighbouring buildings and feature a hierarchy of detail, with the ground floor doors to the retail space in a striking polished metal. 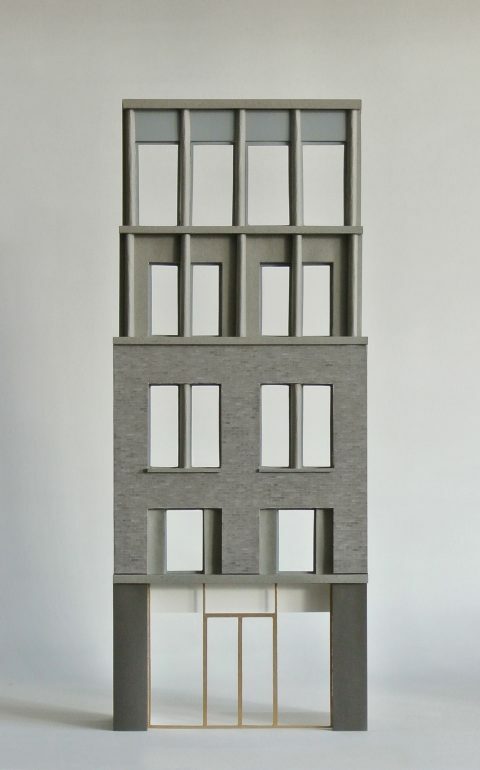 As with Redchurch Corner, the upper floors (benefitting from a greater separation from the street) are more open, with windows increasing in size and the facade becoming one of columns, rather than openings in brickwork. The columns hint at the character of the facade to Whitby Street. Whitby Street has a more semi-/post-industrial mews nature with a mix of building styles and scale. 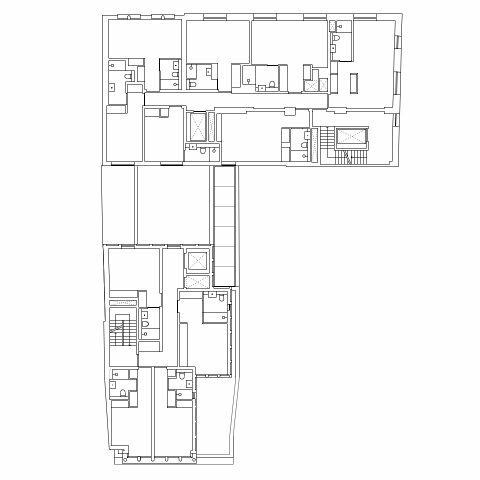 The ground floor of the new scheme houses a full-width set-back entrance, which activates the street in a controlled manner, while the upper floors reference the Victorian industrial typology of a brick and cast iron hybrid structure prevalent in local warehouses. 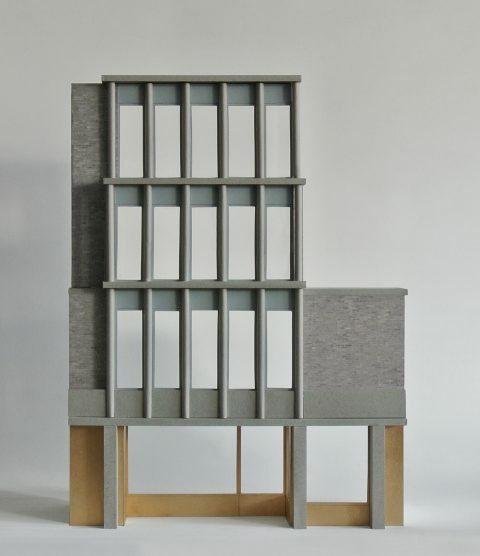 The facade is articulated by a series of columns, like those on the upper floors of the Redchurch Street facade, with large openings onto the quieter mews-like Whitby Street. Instead of cast iron, the columns and floors are of fine pigmented concrete, creating a simple and refined take on an ‘industrial’ appearance. 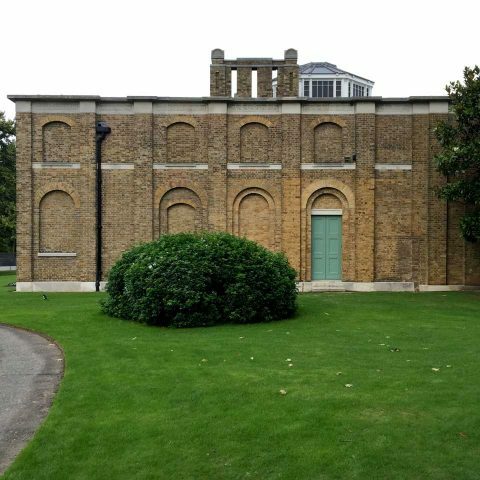 The necessarily blank side elevations are relieved by a series of blank brick-framed panels with coursing bands, akin to those found on the South elevation of Soane’s Picture Gallery and Almshouses in Dulwich. 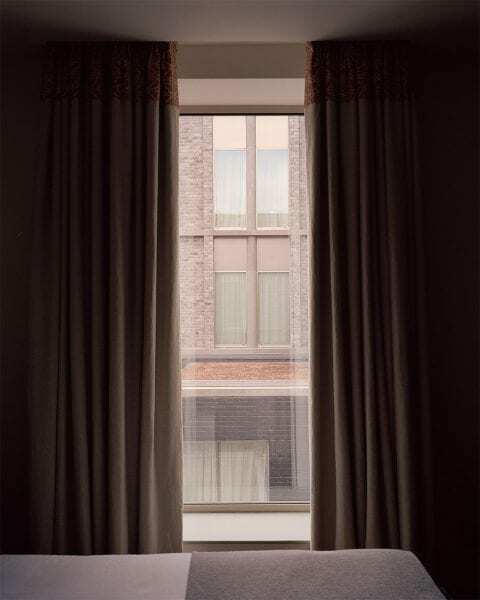 The new scheme does not merely mimic or form a visual extension to the previous Redchurch Corner scheme that it adjoins and extends, but has a visual and material language of its own; maintaining the fairly piecemeal nature of the local urban fabric of mid-rise, narrow-fronted buildings. 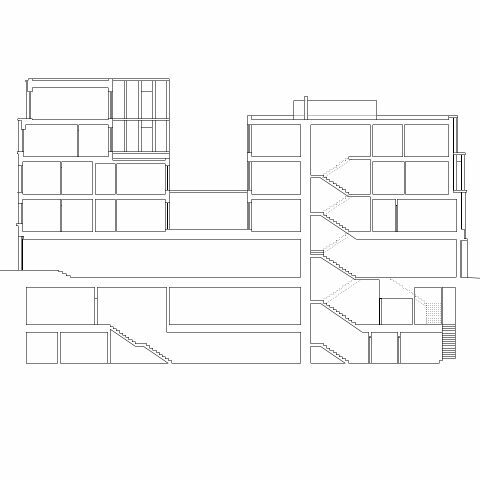 Instead, it is the proportion of the new building that relates directly to that of its neighbour, with concrete banding at first and third floor continuing through from Redchurch Corner and an attic storey that knits together the roof levels of both 58-60 and 54. 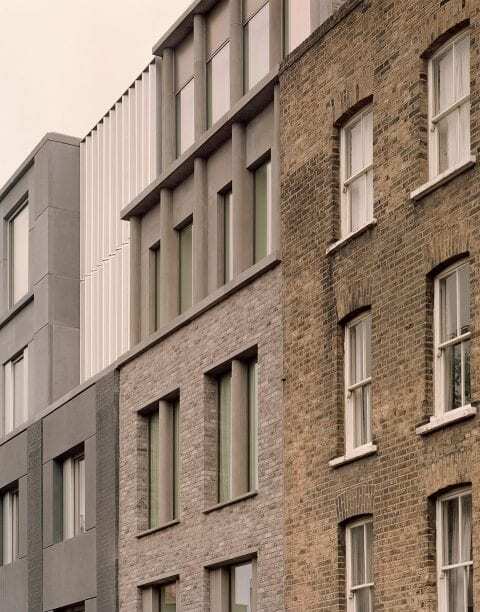 The grey brick chosen for the first and second floors of the new scheme complements the dark grey of the jesmonite panels on Redchurch Corner, while lending the new building more texture and variation, and providing a smooth transition to the stock brick of no. 54. That the two new facades incorporate similar elements in a similar material palette (albeit articulated in a slightly different way), ensures that the building is read as a coherent entity when walking around the urban block. 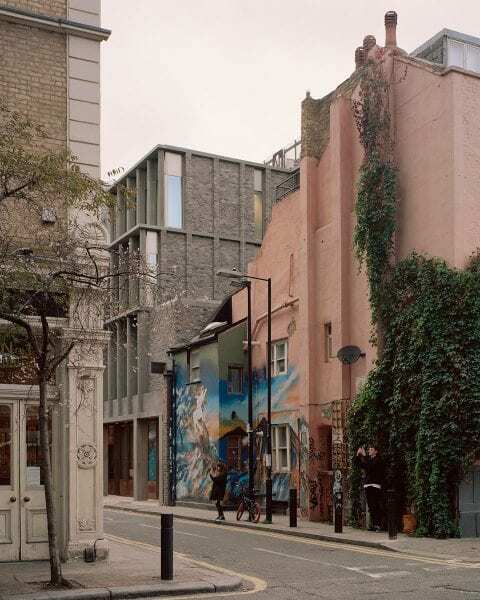 That the new scheme shares a language, colour palette and contextual sensibility with Redchurch Corner, ensures that the two schemes are read as parts of the same whole.